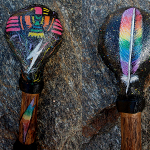 By the artist "Moon Cat", the Lightening Rainbow Thunderbird Rattle embodies the energy of Unity, hope, peace and prophecy. 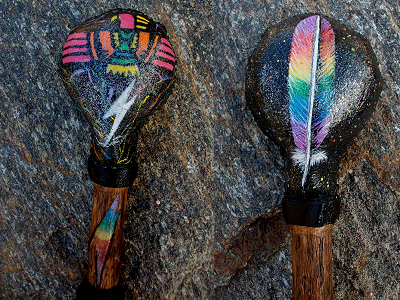 Our Ancestors long ago spoke of a time when the Rainbow Tribe would return to Earth, and create a new way of life. This way of life would be built upon, and breaded together with, the teachings of the Ancient Wisdom. Co-create unity, hope, peace and the fulfillment of ancient Prophecy by using this powerful Rattle. This Rattle is made from rawhide and contains organic corn, selenite and clear quartz crystal within it. It also has a lightning bolt hand carved and painted into the handle of it.